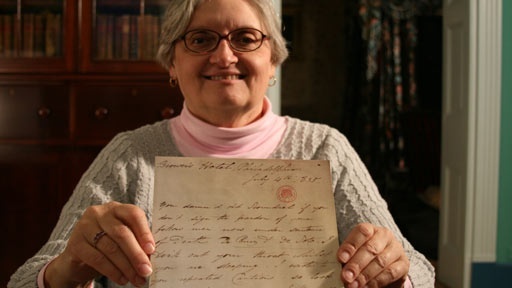 History Detectives investigates a letter which indicates that thirty years before John Wilkes Booth assassinated Abraham Lincoln, Booth’s father threatened to kill another sitting president, Andrew Jackson. The letter to Jackson reads, “You damn’d old scoundrel… …I will cut your throat whilst you are sleeping.” It’s signed “Junius Brutus Booth.” The writer insists Jackson pardon two men who were sentenced to death. Why did the fate of these two men enrage such fury? Was the Booth letter a hoax? Or does assassination run in the Booth blood? Related Investigation Red Cloud Letter How was a leader of the Lakota people connected with the controversial sculptor of Mount Rushmore? Related Investigation Lincoln Letter Does this cryptic letter reveal Abraham Lincoln's secret strategy for winning political power? Also with Tukufu Zuberi Beatles Autographs Are these genuine Beatles signatures? Also in Expansion: 1801-1861 1856 Mormon Tale Is this tattered book a true account of female slavery in the old West? Also with Tukufu Zuberi Hot Town Poster What role did this striking poster play in the explosive events of 1960s America?